What a Bad Dream by Mercer Mayer was published in print in 1992. It tells the story of Little Critter and a dream he has where a magic potion turns him into a monster that no one wants to be around! The touching ending is one little (human) critters will readily identify with and one that will (hopefully) bring sweet dreams. The digital version of this story also adds a new twist, keeping track as the reader tries to find all the little grasshoppers and spiders (20 of each) hidden on every page. Many readers have asked, "What kind of animal is Little Critter?" According to Wikipedia, Mercer Mayer did not specify which type of animal the Little Critter is, but, "he resembles a hedgehog, hamster or guinea pig." So, basically he's a rodent ... although a rather lovable one! Over 200 books have been released in this popular series, not to mention a whole line of toys, dvds and other products. Like the Seuss books (also by Oceanhouse Media), this book is interactive in a way that enhances early reading skills. Most images (of mom, Little Critter and the people & things around them), will name themselves aloud while the word briefly appears over the illustration. For example, touch the hat on Mom's head and the word "hat" appears and is spoken aloud by the narrator. 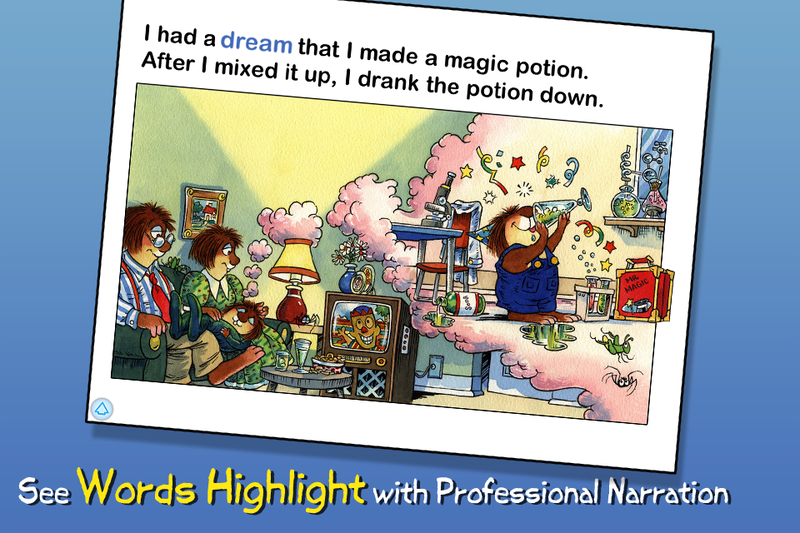 For young readers and pre-readers, the text also highlights as the narrator says each word. The delightful child narrator is easy to understand and a perfect fit, since the story is told in the first-person by Little Critter. Parents will identify with the universal struggle of shopping with small children and admire Little Critter's mom who seems to have been born with the patience of Job.